I am sure that Jeanne’s spirit surrounded us that day, the 15th of September, 2017. We were not a large group but we filled the Canadian chapel of St. Jacques church in Dieppe, France, one of the parishes where Jeanne had lived. Robert Lévesque, Jeanne’s second husband was represented by members of his family, including members of the Lévesque Association from Quebec and my cousin Reverend Monseigneur C. Peter Dumont. Also present was Stephane Godet from Hautot-Saint-Sulpice, the village where Robert was born. Jean-Baptiste-François Deschamps de la Bouteillerie, Jeanne’s third husband and the founder of Rivière-Ouelle, was represented by Jacques Deschamps de Boishebert, one of the descendants of Jean-Baptiste’s older brother, Adrien, and his family. Rivière-Ouelle, the village in Quebec where Jeanne, Robert and Jean-Baptiste lived for so many years, was represented by its Mayor, Louis-Georges Simard, as well as by residents of the village. And Jean-Pierre Allard and Brigitte Guitard of the Committee to Save Saint-Jacques and Saint-Remy Churches. Unfortunately, Father de la Tousche, the parish priest for Saint-Jacques, was not able to attend. For me, that day was particularly moving. After having followed Jeanne over the course of several years and after having written her history, I was very pleased to provide her with one more honor with the installation of the plaque. I very much appreciate the support for the project of the Levesque Association, represented by Francoise Lévesque-Pare and her husband Philippe. The presence of all those people in the Canadian chapel to honor and recognize Jeanne, for her life, her legacy and in addition, as a representative of all the Filles du Roi, the mothers of Quebec, was especially important. After a few brief words, I unveiled the plaque which Peter blessed in Jeanne’s honor. The beautiful plaque was designed and created by La Marbrerie Rivière, in Dieppe. I must especially mention the help of Agnès Rivière in this project. 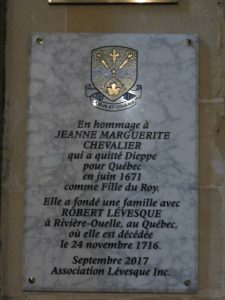 Note: The plaque reads: In honor of Jeanne Marguerite Chevalier who left Dieppe for Quebec in June 1671 as a Daughter of the King. She raised a family with Robert Lévesque in Rivière-Ouelle, Quebec, where she died on November 24, 1716. September 2017, Lévesque Association, Inc.